In the lead up to this month’s Orange Day Sale happening from June 13 to 15, Shopee, the leading e-commerce platform in Southeast Asia and Taiwan, launched its latest in-app game, Shopee Shake, with the promise of over 2.6 millions worth of Shopee Coins to be given away. 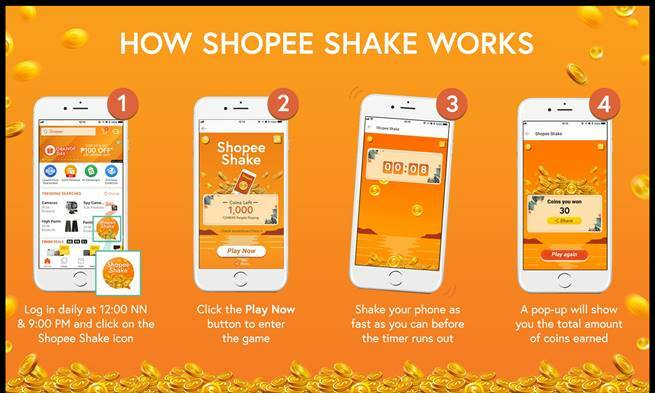 Within the first three days of its launch on 8 June, Shopee Shake recorded a total of over 100,000 users logging in to the Shopee app during the designated game timings (12 noon and 9pm daily) and shaking their phones for a chance to win Shopee Coins. From now till 15 June, users can look forward to winning more Shopee Coins by taking part in Shopee Shake. To add to the excitement, Shopee will also be holding a weeklong social media contest where users are invited to post videos of themselves doing the Shopee Shake on Facebook or Instagram. Users should include the hashtag #ShopeeShakePH to stand a chance to be one of three lucky winners to walk away with an iPhone X, Fujifilm X-T20, or Nintendo Switch. In addition to the launch of Shopee Shake, Shopee will also be holding its monthly Orange Day Sale from June 13 to 15. Users can look forward to discounts of up to 90% off, 2 for the price of 1 deals, category collections, beat the clock vouchers and many more. As a special treat this Orange Day, users can also enjoy 24 hours of free shipping with a lowered minimum spend of just ₱250 on June 13. What are you waiting for? Set your alarms, mark your calendars, and get ready to shake and shop this Orange Day!